Remember that time I picked Edmonton Oilers to win the Stanley Cup and then they didn’t even make the playoffs? Not even that scar, which will live on in TSN archives forever, can save me from making myself look stupid again. 1. ANAHEIM - Dallas Eakins will replace Randy Carlyle as Ducks coach before Christmas. There wasn’t a single NHL coaching change last season for the first time since 1966-67. Eakins has a .615 winning percentage in AHL San Diego since being fired by the Oilers in 2015. 2. ARIZONA - The Coyotes will be playing meaningful games in March for the first time in five seasons. He only played 47 games last year due to injury, so it’s easy to forget how spectacular goaltender Antti Raanta was with the second-best save percentage (.930) in the league. 3. BOSTON - After this 21st season, Zdeno Chara will skate off into the sunset. “Big Z” will go down as one of the most incredible specimens ever to play the game, from his league-exception length stick to fit his 6-foot-9 frame to his all-world fitness level that allowed him to reinvent himself in a younger, faster game and still be a key contributor at age 41. 4. BUFFALO - With all eyes focused on newcomer Jeff Skinner and rookies Rasmus Dahlin and Casey Mittelstadt, it will be Sam Reinhart who again flies under the radar into the 60-point club. Reinhart had one of the best seasons no one talked about last year with 25 goals and 25 assists for 50 points. 5. CALGARY - Bill Peters will taste the Stanley Cup playoffs for the first time in his NHL head coaching career. The Flames will be one of Canada’s four postseason entries, joining the Jets, Maple Leafs and their provincial rival Oilers. 6. CAROLINA - Take the Over: Sebastian Aho will obliterate the 64.5 point total set for him by Las Vegas bookmakers. More importantly, Aho will help the Hurricanes back to the postseason for the first time since 2009 – when he was just 11 years old. 7. CHICAGO - The demise of the Blackhawks won’t be Jonathan Toews or an aging blueline core, but rather their goaltending. With so many question marks surrounding Corey Crawford’s health, signing Cam Ward was the riskiest bet of the off-season by any NHL GM. 8. COLORADO - The Avalanche will win the 2019 Draft Lottery, adding insult to injury in a disastrous Senators season. Colorado may even get two cracks at the lottery if the Avs can’t duplicate last year’s magic. 9. COLUMBUS - The Blue Jackets will miss the playoffs for the first time in three seasons. Clouded by the uncertainty of Artemi Panarin and Sergei Bobrovsky’s futures, plus no Seth Jones for the first month of the season, and you can already see things sliding off the rails. 10. DALLAS - Rookie bench boss Jim Montgomery will win the Jack Adams Award as coach of the year. Unlike last year when Dallas epically collapsed, the Stars might start a little slower but will be one of the NHL’s best teams in the second half of the season as they become a dangerous playoff opponent. 11. DETROIT - Steve Yzerman will return home to become the Red Wings’ next general manager after fulfilling his contract with the Tampa Bay Lightning at the end of this season. After 30-plus years with the Wings and four Stanley Cups, the time will be right for Ken Holland to step into another role. 12. EDMONTON - Connor McDavid will lap the field, winning the Art Ross Trophy by at least a 15-point margin as he widens the gap between himself and the rest of the NHL. This is the year McDavid picks up the Oilers and drags them into the playoffs. No need for a Hart Trophy debate this year. 13. FLORIDA - The Cats will be on the prowl in the playoffs for just the third time this century. After falling one point short last year, Bob Boughner’s team will be a force to be reckoned with in the East, earning the first wild-card spot behind the Big Three (Boston, Tampa and Toronto) in the Atlantic. 14. LOS ANGELES - Take the Under: Ilya Kovalchuk won’t hit the 60.5 point total set by Vegas oddsmakers. Kovalchuk will underwhelm in his return to the NHL, proving a player without wheels isn’t a good fit for a team with a reputation for playing slow. 15. MINNESOTA - Eager to put his stamp on the Wild, new GM Paul Fenton will make a direction-altering trade to begin a period of transition. Think Mikko Koivu or Eric Staal. The Wild ice one of the NHL’s oldest opening-night rosters with an average age of 29. 16. MONTRÉAL - Carey Price will not revert to his all-world form in the first year of the NHL’s richest contract for a goaltender at $84 million. That will have more to do with the lack of support in front of him than Price himself, who will have a middling campaign. 18. NEW JERSEY - After an incredible turnaround, the Devils will fail to sustain that momentum and fall short of a second straight playoff appearance. The Metropolitan Division is no joke and the Carolina Hurricanes will squeeze out the East’s final playoff spot in the final week of the season over the Devils. 19. NEW YORK ISLANDERS - If you thought losing John Tavares was painful, new Isles GM Lou Lamoriello will have his hands full with pending UFAs Jordan Eberle, Brock Nelson and Anders Lee. It will be an uncomfortable year for the NHL’s homeless team, splitting the season between Brooklyn and Nassau Coliseum. 20. NEW YORK RANGERS - Henrik Lundqvist will pass Curtis Joseph to take sole possession of fifth on the NHL’s all-time wins list. Lundqvist needs 24 to do so, a mark he’s hit in all 13 of his seasons, including the 2013 lockout-shortened campaign. 21. OTTAWA - Matt Duchene will be traded before the Feb. 25 deadline. GM Pierre Dorion will be forced to recoup assets with Duchene unclear on his intentions to re-sign in Ottawa. Mark Stone will ink a long-term extension to help lead the Sens forward. 22. PHILADELPHIA - Finally healthy and built to blast off, Nolan Patrick will reintroduce himself to the NHL with a 55-point season. With linemates James van Riemsdyk and Jakub Voracek, Patrick will hit the 25-goal mark and have the Flyers in position to win their first playoff series since 2012. 23. PITTSBURGH - The Penguins will fall short of 100 points for just the third time since Sidney Crosby’s rookie year. An improved East and potential for injury to Pittsburgh’s 30-something core will seriously test Jim Rutherford’s roster depth to keep the 12-year playoff streak alive. 24. SAN JOSE - Erik Karlsson will win his third Norris Trophy, cementing himself among the all-time great defencemen with Chris Chelios, Paul Coffey and Denis Potvin. He’ll find chemistry and rhythm with new partner Marc-Edouard Vlasic, one of the premier shutdown ‘D’ of his generation. 25. ST. LOUIS - Ryan O’Reilly will finally get the recognition he deserves as one of the NHL’s premiere centres as he tops the 80-point plateau for the first time in his career. He’ll help the Blues make the rare jump from non-playoff team to true heavyweight contender in the murderous Central Division. 26. TAMPA BAY - The Lightning will advance to the Stanley Cup Final after falling one win short in two of the last three springs. Nikita Kucherov and Steven Stamkos will continue to be the NHL’s most lethal duo. They produced a league-best 4.08 goals per 60 minutes last season together at even-strength. 27. TORONTO - Mitch Marner will lead the Maple Leafs in points for the second season in a row. You read that right: not John Tavares, not Auston Matthews. Quarterbacking what should be the NHL’s No. 1 power play and getting the “Tavares Bump” on J.T.’s line could even make Marner’s next contract more intriguing than Matthews. 28. VANCOUVER - Move over, Pavel Bure: there’s a new Rookie of the Year from Vancouver. Elias Pettersson will capture the Calder Trophy, making him the first Canuck to do so since Bure in 1992, as Vancouver returns to relevance in the country’s pecking order. 29. 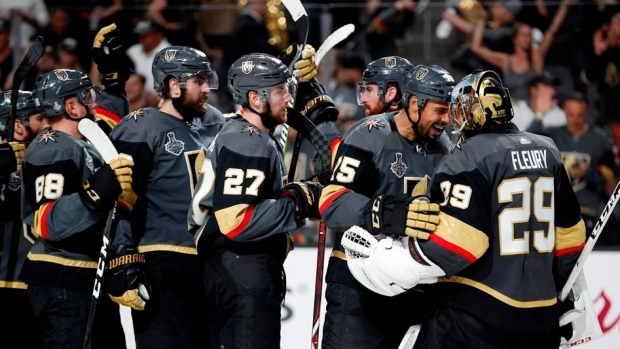 VEGAS - The Golden Knights will hoist the Stanley Cup in their second season, setting a standard no pro sports expansion franchise will ever match. Fool me once, fine. Fool me twice, shame on me. Betting against Vegas is exactly what the Golden Knights want you to do. They’re reveling in the fact many say last season’s collection of career bests can’t be duplicated. Watch them. 30. WASHINGTON - No hangover for Kuzy. There will be no doubt the Caps are Evgeny Kuznetsov’s team now. Kuznetsov will become the fifth 100-point scorer in Caps history, joining Alex Ovechkin, Mike Gartner, Nicklas Backstrom and Dennis Maruk. 31. WINNIPEG - Connor Hellebuyck will take home the Vezina Trophy one year after finishing as runner-up. Hellebuyck has the confidence of a goaltender rarely seen publicly and the team support in front of him to make the Jets a true contender. Between Hart, Calder and Vezina, that’s a lot of predicted hardware for Canada – with just one prize missing.